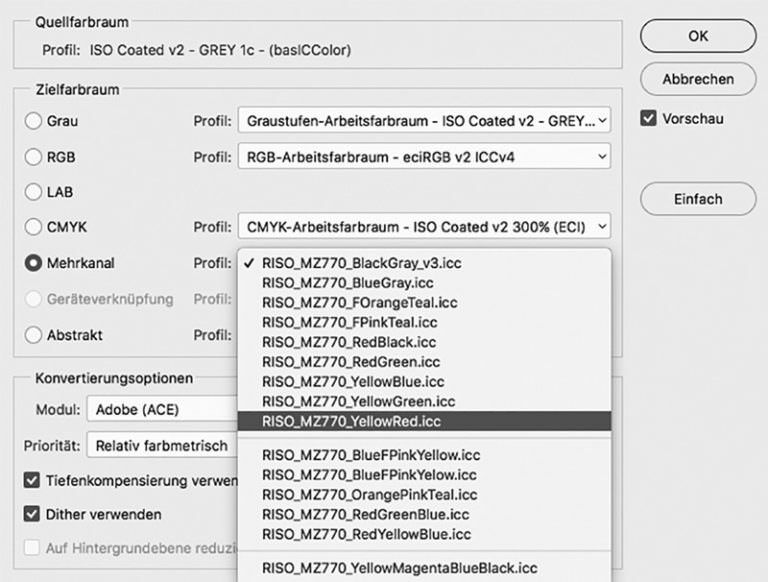 Within the work on this publication, various color profiles have been created for the risograph (see subchapter F), which can be applied within a few clicks within Adobe Photoshop. The process of converting an image to a new color space is called gamut mapping. In order to convert the colors of images and, for example, to jump from the RGB color mode to a multichannel profile, Adobe Photoshop offers different rendering intents when converting via Image » Convert to Profile, which will be briefly shown here. 2 Adobe Photoshop, "Convert to profile" pop-up, The DuploPress multi-channel profiles in overview. Using the correct rendering intent is recommended. 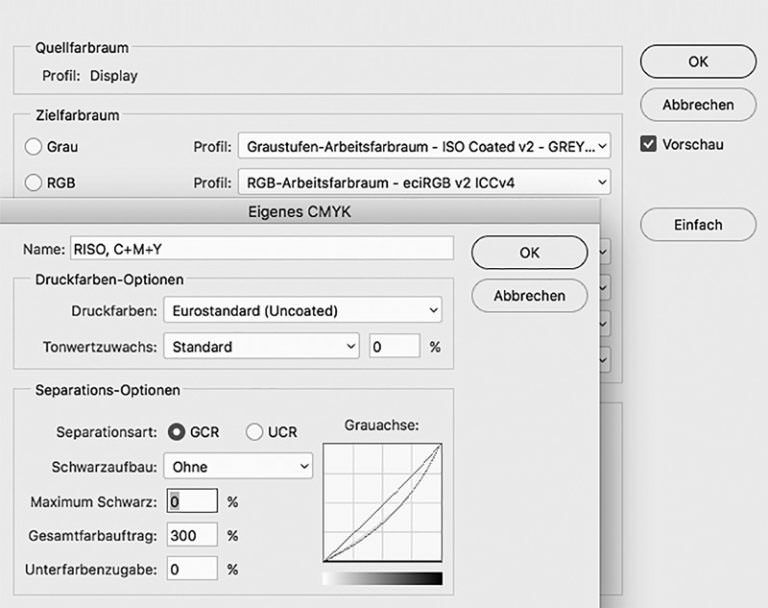 After all, when converting an image into a new color profile, there is always the risk that color values ​​may be incorrectly converted and thus the color impression within the new profile may appear inadequate. Depending on the type of image, these results can vary greatly. 1 The conversion of the color values into a new gamut is accomplished using rendering intents. 2 An image software, for example Photoshop, can use all color profiles on the hard disk and offers to take one of these for profile conversion. If you have a profile for the conversion of the files to the primary colors of the Risograph, then you can save this profile after the download in the folder provided by the operating system, for the Macintosh this is /Library/ColorSync/Profiles, for Windows systems this is C:/Windows/system32/spool/Drivers/Color. To start using your profile, all Adobe programs must be restarted, as long as they are open during the process of copying the file. The perceptive rendering intent offers the possibility, the colors in the conversion particularly true (perceptio percipere of percipere “capture, seize, perceive”) 3). The general color character of the image should be preserved, but this is at the expense of exact color reproduction. Colors that may not be within the color space of the transformation are compressed and converted to less saturated but available colors within the color space. The result may result in a possibly low saturated motive. Nevertheless, the perceptive rendering intent offers the possibility to keep color intensive motifs coherent. brightness within the pictures are changed. If the exact hue is less important than the color intensity (eg for vector graphics or diagrams), this conversion method should be considered. The relative colorimetric conversion is first analyzed the white point of the subject, then the distances of the colors are measured and converted to this. Again, as with the perceptual rendering intent, the colors at the color space edge are cut off and converted into hues that lie within the profile, which can lead to the fraying of very bright hues (banding). As long as the image has no critical gradients or there are not too many colors outside the target color space, the conversion with the relative colorimetric rendering intent is close to the original subject. The absolute colorimetric rendering intent takes the white point of the source color space into account, shifts it into the target color space and thus also the absolute color values, which is why it is the rendering intent that is preset in most image editing softwares. The colors are rendered brilliant and luminous, similar to the saturation-prone color space. The absolute colorimetric conversion is particularly good if the source and the target color space are of similar size, since all colors remain unchanged within both color spaces, which is why this conversion method is particularly suitable for the three- and four-color profiles on Risograph. What is color management? Episode 8: WAS IST COLOR-MANAGEMENT?